I did a lot of fun things this weekend. I got to hangout with my L.A. blogger friends, spend time with family and a much needed stress relieving night out where Chris and I spent laughing our butts off watching Adam Carolla and Jimmy Kimmel at the Wiltern Theatre in L.A. I cooked and I baked too. Since our blogger meet-up was a potluck, I decided to make veggie bars. I have made these veggie bars to many potlucks before and they are always a hit, even for non-veggie eaters. 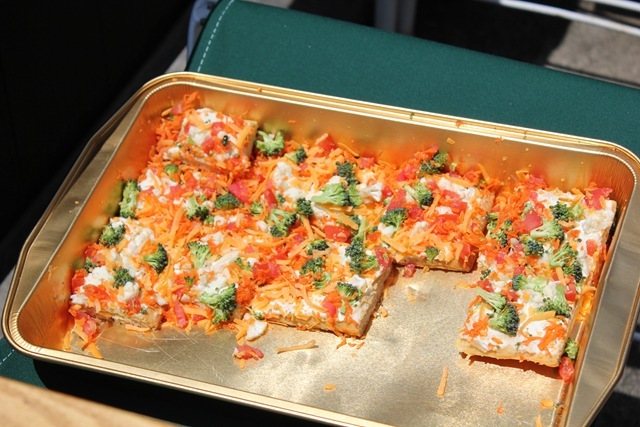 I first ate these veggie bars back in high school at my friend Evie’s house. I can still remember her kitchen with a door that leads to the game room and then on to the pool. We spent many summer afternoons just laying by the pool and eating these bars. I’ve had the recipe for years and after college, I finally started making them. I cut the recipe in half since I only need to make food that served 6 bloggers. I still had extra cream cheese spread though. Please read tips below in the instructions. – Pre-heat oven according to directions on the crescent rolls. 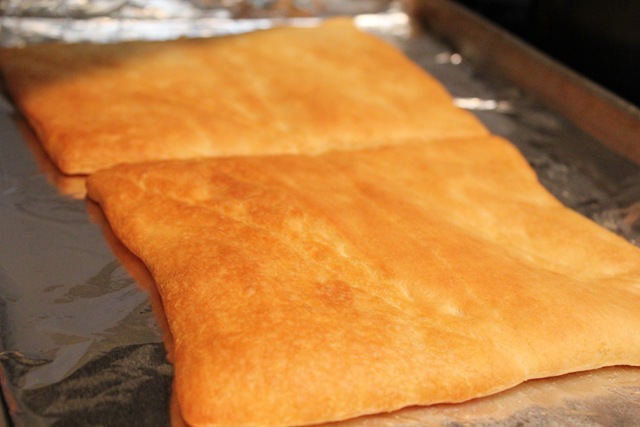 Unroll crescent rolls on large baking sheet, it may not fit but cut dough accordingly. 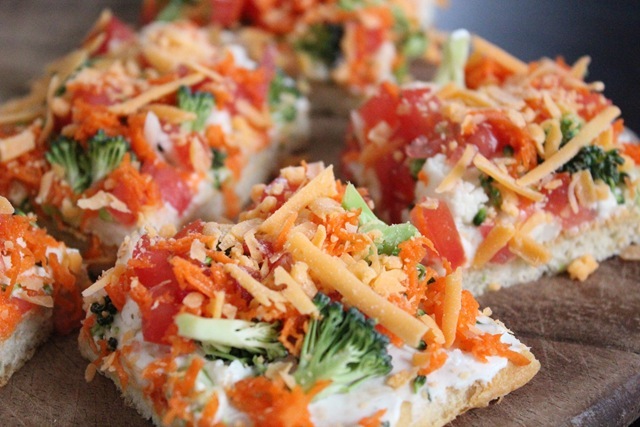 You’ll probably have some extra dough left to make a mini veggie bar. -The rolls are in triangular shapes so you have to pinch them together to form one large sheet of dough. If you don’t do this, the rolls are likely to come apart and your guests will make a big mess on themselves. -Bake until golden brown, maybe a few minutes more than what is recommended on the packaging. 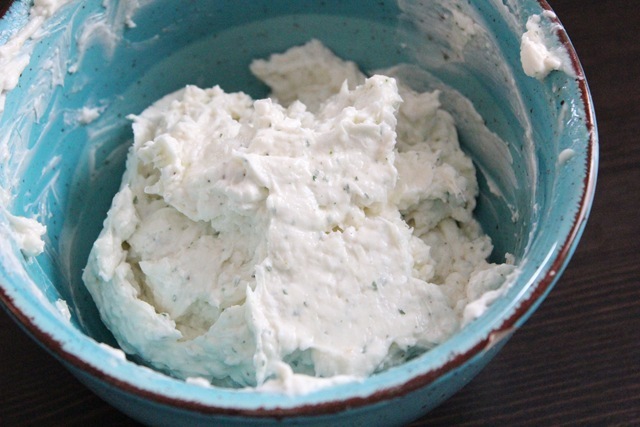 -While the dough is baking, mix ranch package, mayonnaise, and cream cheese in a large bowl until it forms a smooth frosting-like consistency. Refrigerate. – Take the dough out of the oven and let cool. Make sure you loosen the dough from the bottom of the baking sheet with a spatula when you pull it out because it will harden and you’re likely to break the dough if you loosen it when it’s cooled off. – While the dough is cooling, cut broccoli and 1/2 the cauliflower to form little tiny trees. I didn’t throw away the stems and saved them for my salad for the week. Dice tomatoes and drain any excess liquid that may have seeped out during cutting. 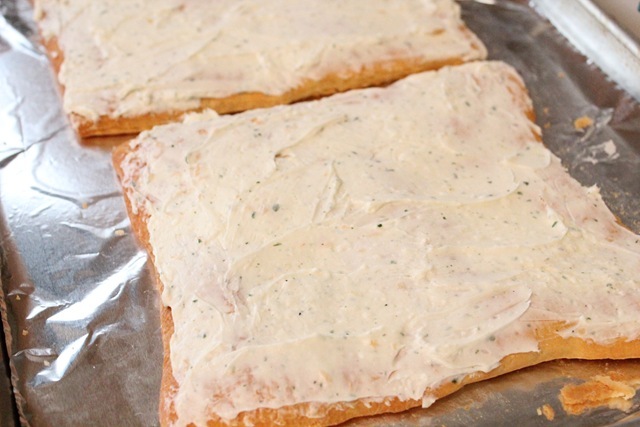 – When the dough is cooled, spread a thin layer of cream cheese (about half of mixture) on the dough. If you use too much it may get salty so try the cream cheese spread before hand and apply on the dough according to your taste. 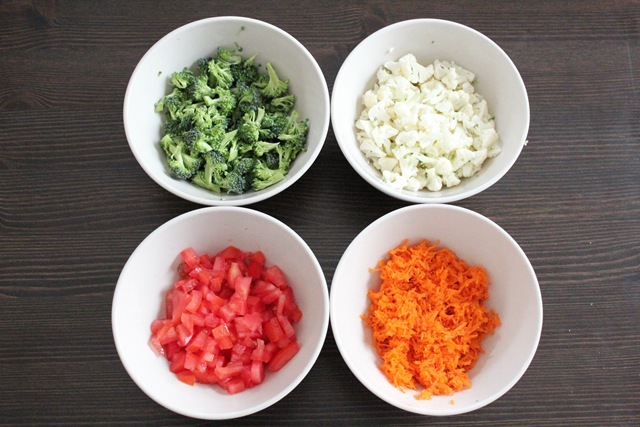 -Next, sprinkle the cauliflower first, then the broccoli, then the tomatoes, and finally, the carrots on top of all of that. Do it in this order, the bars will look prettier. Tip: I don’t recommend pre-shredding the carrots because they tend to stick together and you’ll have clumps of carrots when you sprinkle it on. Shred and sprinkle the carrots directly on top of the bars. 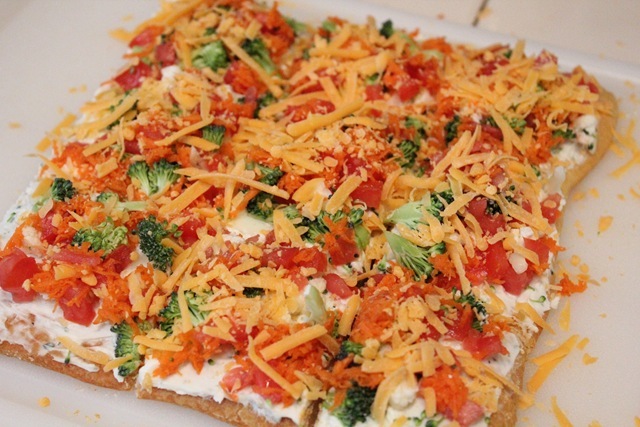 – Next cut appetizer sized squares and then sprinkle the cheese. If you cut it after you put the cheese on, it too will clump up and you’ll have large chunks of cheese balls on the veggie bars. It’s better to cut it first. Here’s a picture of a half-eaten tray at the potluck, which I will recap soon with more pictures. I love broccoli and cauliflower!!! Especially on pizzas!!! What a great weekend 🙂 I’ve never had a veggie bar before- what a great recipe. Crescent Rolls have like a million in one uses! 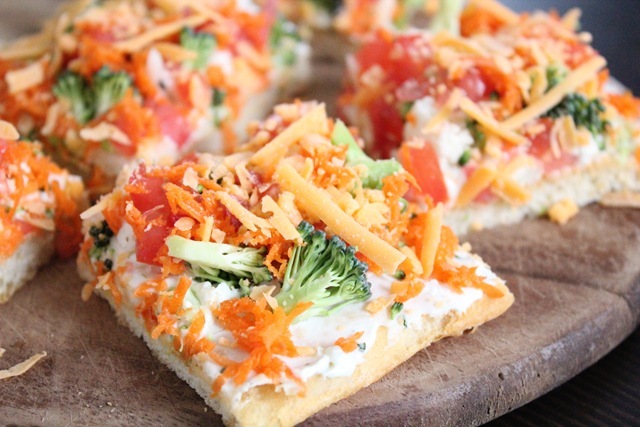 Those veggies bars look so good! 🙂 Love the recipe. I’m going to have to try making these! These sound delish!! Great recipe. Those look absolutely delicious I can probably veganize them with Vegenaise and Tofutti’s Better than Cream cheese. I’ve had something similar before and loved it. I didn’t have the recipe, but now I do! I’m going to give these a try at a BBQ or two this summer. Yum!!! my mom made something similar for my sister in laws bridal shower and it was so good!!! Those look great! 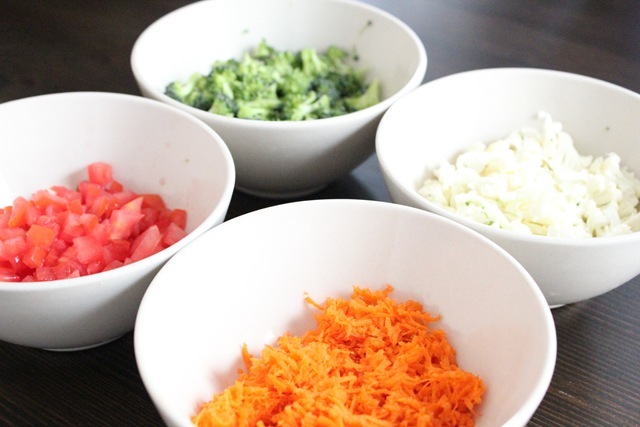 It’s like of like a colorful pizza…. mmmm. They were delish! I want to make them a.s.a.p. !